The new e-skin display developed by researchers from University of Tokyo will enable demonstration of blood oxygen level, e-skin heart rate sensors for athletes and many other applications. The flexible organic optical sensors may also be directly laminated on organs to monitor the blood oxygen level during and after surgery. Featuring Silicon Oxynitrite and Parylene it encloses a super-thin substrate on which the researchers successfully mounted thin and flexible OLED displays and photosensitive diodes. The whole assembly sealed the passage of oxygen and water vapour in the air, extending device lifetime from the few hours seen in prior assemblies to several days. Using the new protective layer and ITO electrodes, the research group created polymer light-emitting diodes (PLEDs) and organic photodetectors (OPDs) thin enough to be attached to the skin and flexible enough to distort and crumple in response to body movement. Optoelectronic devices are especially important in medicine because these devices can noninvasively detect vital signs and other clinical information. The researchers fabricated three-color (red, green, and blue) PLEDs. By laminating ultraflexible optical devices onto the skin, comprising of health-monitoring sensors and displays, the biological information is measured by an ultraflexible optical sensor that could be shown using an analog display laminated on a face and a hand. Information can also be presented more intuitively by changing the intensity and/or colors of the PLEDs. 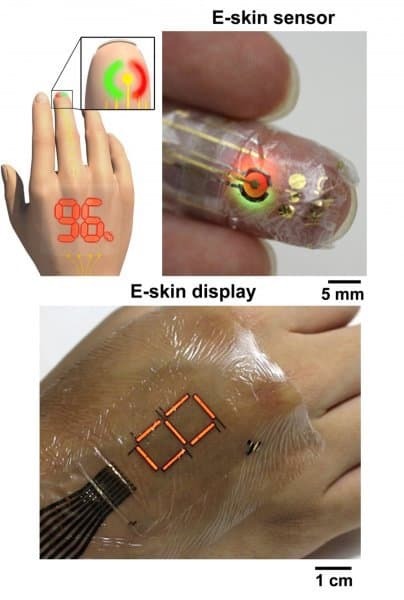 Researchers hope to improve on the advance, by allowing the e-skin to display numbers and letters for easier health monitoring and also to work on powering the e-skin through body heat, or to find a way to use flexible batteries as an alternate source. Integrating electronic devices with the human body to enhance or restore body function for biomedical applications has been the holy grail of researchers around the world, the new breakthrough sure brings this dream closer to reality. It would be difficult to transform it into a working product, though. Also Microsoft already has an edge over this through their Microsoft Band 2-the only wearable device to record Oxygen levels. Agreed. The product is prototype of sorts. There is room for more advancement.